500 gm cartridges for use with the two-handed grease gun. KAJO-Extreme Pressure Greases EP – series are based on high-class base oils, using lithium soaps as thickener (Li-12-hydroxy stearate). Due to this, they have an outstanding work resistance. Furthermore, KAJO-Extreme Pressure Greases EP –series contain additives to improve the rust and corrosion protection behaviour. Lubricants for universal use in industry and the field of motor vehicles. 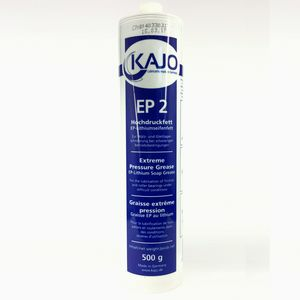 With only a few exceptions, KAJO-Extreme Pressure Greases EP – series are very suitable for most applications. They are used in friction and roller bearings at grease lubricating points in motor vehicles, equipment, machines, conveyors, construction machines, etc.